The poet's practice is speed and feeling, a sensuous eye roving over its subjects with a hip distinctiveness that announces style and lyrical sentience. Nicole Terez Dutton's If One Us Should Fall is all art song with a velocity of seeing that delights any reader's yearning for a new experience with language, a new doctrine on how to live meaningfully inside the music. Nicole Terez Dutton’s fierce and formidable debut throbs with restless beauty and a lyrical undercurrent that is both empowered and unpredictable. Every poem is unsettling in that delicious way that changes and challenges the reader. There is nothing here that does not hurtle forward. 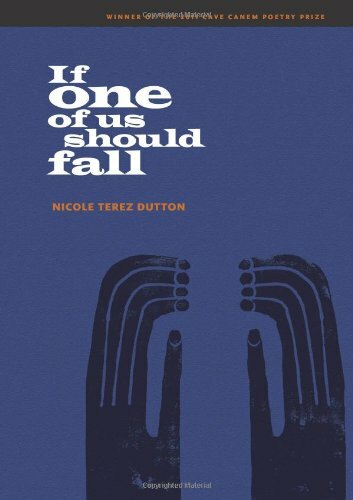 Nicole Terez Dutton’s If One Of Us Should Fall is sensational in both the laudatory and literal sense. Her poems are full of exacting language and feeling, the swells and pitfalls of desire, “the music that swallows us whole.” Her muse is not Orpheus so much as a tenacious Eurydice singing,“I love that sky the whole way down” even as she falls. It is a new sense of myth and music this blazing debut gives us. Sensory, sensual, sensational: a whole lot of Hot Damn.